It's fall without the traditional colors, but it's the best of both worlds to me. The whites and silvers that I love and a soothing palette. I love the simple look too--less dusting! The pumpkins on the candlesticks looks perfect. Very pretty, Karen! I love the simple look myself. The white pumpkins on your mercury glass candlesticks say Fall in a soft way. I love the mercury glass & white pumpkins together! White pumpkins are my absolute favorite. Also, putting the books together with the webbing is such a creative idea! I love the white pumpkins on the mercury glass candlesticks! Very elegant looking. I pulled out all my decorations but I just can't get it all arranged like I'd like it. Hmmm. I like your idea better! I love your home, it is so beautifully decorated! Thanks for sharing. Very pretty, elegant and yes...simple. I love the vignette. Simple & perfect! Why is it that mercury glass looks beautiful in every situation? Perfection...I just love, love your style! SIGH! 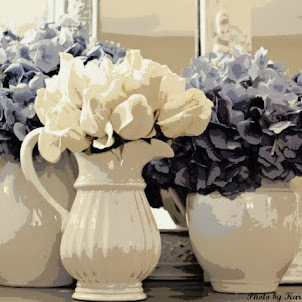 This vignette is so artful and pretty! So simple, yet makes a big statement! Beautiful as always, Karen!! I think it looks lovely. Your K.I.S.S. approach has a big impact. LOVE the white pumpkins! So,so pretty! I hope you are doing well Karen! 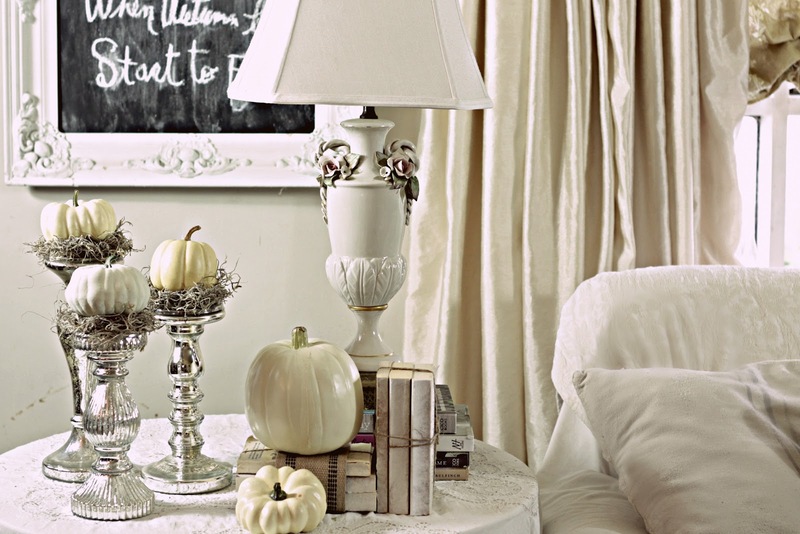 Very pretty with the white pumpkins and the silver candle sticks. Simple and elegant. It's really beautiful and elegant. I love it! Classic whites and mercury glass.... perfect! Visiting from WOW. The vignette is very pretty and elegant! And I love that lamp! You can never go wrong with an understated tonal vignette! Lovely! I love the soft white colors of your table. It is perfect, not too cluttered, and makes we want to paint my lamp a shade of white and use your soft tones. Just gorgeous! What more can I say...ahhhhh...I just love your Fall decorating! KISS is right - perfectly kissable simple! Love the white look! I have always loved the rich traditional fall colours but for some reason, this year, I'm looking to do our Thanksgiving table (Canadian - this wknd) in a more neutral pallet and your vignette has inspired me. Thanks for sharing! I love white and it always seems to be the color I go with - I think your table looks gorgeous!!! This is my kind of fall decorating. Love the simplicity and elegance of your arrangement. I'm dign' on this....my favorite decor...white(and I love me some silver too),saw you at StoneGable! This was so pretty I had to pin it! What a beautiful vignette ... love! Oh what a pretty vignette, I do love your style, I have come to visit from Show and Tell Friday. Your home looks gorgeous, I am so into the French Style. Simplicity in this instance is charming and so pretty! Very Beautiful. Love Love Love it. Found you at 'My Romantic Home's' linky party. Very sophisticated...I love it! I found you at 'My Romantic Home's' link party, too! Am now following you and looking forward to catching up! Sometimes simplicity has it's moments. I think your Fall decor is lovely and elegant. Beautiful home! It's amaizing how you connect decorations in your home. Kinds regards.